​What is the 5fish app? Can I install 5fish without an app store? Can I import GRN programs from elsewhere? Why do deleted programs still appear in My Library? Is it possible to delete particular tracks only from My Library? 5fish is a website and an app for Android™ and iOS (iPhone and iPad). The latest version requires at least Android™ 2.3 or iOS 7. 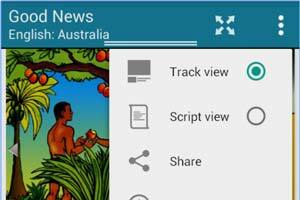 Android: 5fish allows you to download, share, and listen to audiovisual programs of Gospel messages, Bible stories, teachings and songs in more than 6,000 languages. On the screen, tap on the menu icon to navigate to any of the main app screens. The screen also contains the 3 main options Add content for browsing through available programs grouped by language and country, My Library for viewing and organising content, and . Have a look at other help topics to read more about how to find, download, play and share programs. iOS: 5fish allows you to download and listen to audiovisual programs of Gospel messages, Bible stories, teachings and songs in more than 5,500 languages. On the screen, tap on the menu icon to navigate to any of the main app screens. The screen also contains the 3 main options Add content for browsing through available programs grouped by language and country, My Library for viewing downloaded content, and . Have a look at other help topics to read more about how to find, download, and play programs. Android: To find out about all available programs, select Add content on the screen or from the main menu. The Find screen groups programs by languages and languages by countries. Start by selecting a country - swipe through the list or start typing the country name using the search function . Then select one of the languages spoken in this country. You will see a list of available programs in the selected language. Select a program to see information about its content and download size. Each program consists of a number of tracks which can be selected individually or all at once for download . Downloaded tracks are stored on your device. Notice that the list of languages displayed for a chosen country on the Find screen can be adjusted to your preferences: Use the context menu to include non-indigenous languages in the list, to show alternate names for each language or to indicate the availability of language samples next to language names in the list . Tap on a language sample to start listening to the sample. iOS: To find out about all available programs, select Add content on the screen or from the main menu. The Find has options to search for programs via program language or the country where the language is spoken. For example, select to see a list of all countries with languages that have GRN programs available. Select a country by swiping through the list or by typing the country name in the search box . Then select any language spoken in the country to see a list of available programs for that language. Select a program to see information about its content. Each program consists of a number of items which can be selected individually or all at once for download. Downloaded items are stored on your device; each program with at least one downloaded item will appear in My Library. Notice that the list of languages displayed for a chosen country in the Find indicates the availability of language samples next to language names. Tap on the language sample icon to start listening to the sample. Android: As soon as a track of a program has finished downloading onto your device, it is ready to be played anytime you like. One way to start playback is by selecting Manage downloads from the main menu. You will see a list of programs and each program showing the number of downloaded tracks. Select a program to see an overview of included tracks. Tap on the play button to start playing an individual track or all downloaded tracks in the program. While playing a track, swipe up or down the display to switch between expanded or collapsed view of the 5fish player. The expanded view takes up the whole display and shows images that illustrate the contents of the played track. Use the context menu to switch between track list view mode and script view mode , or tap on the icon at the top to switch to full screen mode. The collapsed view of the 5fish player allows you to do other things in 5fish while continuing to listen to the playback. iOS: As soon as an item of a program has finished downloading onto your device, it is ready to be played anytime you like. The corresponding program entry in My Library will show a play icon . Tap on the icon to start playback and switch to the screen with included list of items. 5fish makes it easy for you to focus just on those languages and programs which you are most interested in by adding them to My Library . When you select a language on the Find screen, tap on the icon at the top to add all available programs in this language to the library. For any individual program, use the context menu to mark the program as a favourite . On the My Library screen, use the drop down menu at the top to view the library content grouped by individual programs, languages or programs categories. Use the context menu to switch between different view modes, to determine a certain sort order, to limit the number of displayed programs to the favourite ones or to those with at least one downloaded track. When viewing the library contents grouped by language, tap on a language and then on the icon at the top to remove this language from the library. If you like 5fish, share the app and its programs with your friends. One place to share a program from is the My Library screen (grouped by programs). Long-press the program and then tap the share icon at the top. You can either just share a download link for the program or the audio files themselves (if you have downloaded them onto your device). Select from a variety of ways to share such as Email, Facebook or Messaging. You can also share the 5fish app by selecting Share app from the main menu. Again, sharing can include either a download link or the app file itself, and various ways to share are offered. If you want to share the app file, download it first from the GRN server by pressing the button Download 5fish app file . Use the import GRN programs function found in the main menu. On the following screen, determine the locations where 5fish will look for programs to import, then press Start importing. The import process is automated; after it completes, you will see the newly imported programs in My Library. To customise, select Settings from the main menu. You will see a list of settings related to downloads, playback and other topics, each with explanatory text. Tap on any setting to make 5fish work the way you like. ​The 5fish app allows you to download, share, and listen to gospel messages on your mobile phone. 11,000 recordings in 5,500 language dialects are accessible through the app. While the 5fish app provides access to programs in more than 6,000 languages, the app itself is available in the following languages:• • • • • • Farsi • • • • • • • • • • • • Select Settings from the main menu and tap on "App language" to change the language displayed in 5fish. We greatly value your feedback. You can email our 5fish support team (globalrecordings.net/en/email/webmaster). Yes. The 5fish APK file can be downloaded from 5fish.mobi/android/5fish.apk. Install the app by opening this file on your Android device and enabling installation of apps from unknown sources (under your device's security settings). Audio stored on external storage can be played in the 5fish app after importing using the Import GRN programs function found in the main menu. The 5fish app allows you to store audio files on any external storage connected to your device. If your device contains both primary (emulated) and secondary (SD card ) external storage you will have the option to store audio files on your SD card instead of your primary storage area. The option to do this is contained within the Settings of the 5fish app. You need to create a folder called /Android/data/net.globalrecordings.fivefish/ first. The reason you need to do this can be found at Android Police (www.androidpolice.com/2014/02/17/external-blues-google-has-brought-big-changes-to-sd-cards-in-kitkat-and-even-samsung-may-be-implementing-them/#perhaps-theres-a-plan). Note that if the app is uninstalled this folder along with all files it contains will be deleted. The only way to get around this is to unmount the SD card before uninstalling. Yes. GRN encourages users to share the programs, for example by selecting Share link from the context menu on the screen that shows the details of a program (after selecting the program in My Library or on the Find screen). Read GRN's terms and conditions (globalrecordings.net/terms-and-conditions) for more information. Any screen that shows a list of programs in My Library or via Find offers an option Sort by in the context menu to change the sort order of the programs. Sorting by Favourites will place any programs marked as favourite at the top of the list. Sorting by Recent will place your most recently accessed programs at the top. The Recommended sort order will sort the programs in the order GRN recommends they be listened to. Note that when you are using the Grid view mode then the only supported sort orders are Language name and Type . Selecting any other sort order will automatically change the view mode to List view. A number of app screens offer the option Multi select in their context menu to perform certain actions on multiple items at once, such as: • Deleting , sharing or copying programs listed in My Library or on the Find screen (the delete option will not remove programs from the library but will delete all their downloaded tracks from the device; the copy option is only available for a single selected program and stores its download link in the device's clipboard) • Removing or sharing languages listed in My Library (removing languages will delete all downloaded programs in these languages from the device and remove the languages from the library) • Deleting categories of programs listed in My Library (deleting categories will not remove them from the library but will delete all downloaded programs in these categories from the device) When in multiple selection mode, tap on individual elements to select or deselect them. The number of selected items and the possible actions to trigger are indicated at the top. You can return to normal mode by tapping the back button or by deselecting all items. The contents listed in My Library are based on a set of included languages. A language is added to the library manually by tapping on the top icon on the Find screen (after selecting the language), or automatically when downloading any contents in this language. For all included languages, the library always lists all available programs, no matter if those programs have been downloaded on the device or not. Deleting a program (e.g. by selecting Delete audio from the context menu on the screen that shows the program's details) will delete all its downloaded tracks from the device but the program itself will still be listed in the library. Programs will only be removed from the library once their language is removed. To remove a language, tap on in the library (when viewing contents grouped by language) or on the Find screen (after selecting the language). All downloaded contents in this language will be deleted from the device, and the programs of this language will not longer be listed in the library. To remove a language from your personal library and delete all downloaded contents in this language from the device, select My Library from the main menu, view library contents grouped by language (i.e. select Languages from the drop down box at the top), long press the language that you would like to delete, and tap on the delete icon . Alternatively, while viewing a single language in Find or My Library, tap on the top icon to remove the language. No. There is currently no capability to delete single tracks, only entire programs. Please contact the 5fish support team (globalrecordings.net/en/email/webmaster) if you would like this feature in a future version of the 5fish app. It is however possible for you to delete individual track files using a separate file manager app. You can find the track files under the 5fish/Audio folder. You can help more people use the app by contributing text translations using our web based translation tool called Pootle (globalrecordings.net/en/pootle).